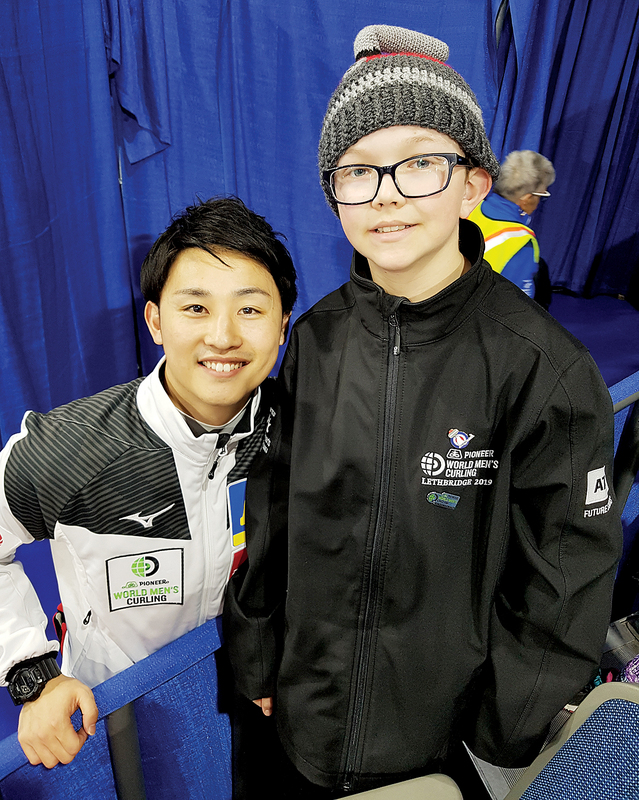 A Taber youth curler had a dream come true when he was one of the winners of an ATB Future Star contest for the 2019 Pioneer Hi-Bred World Men’s Curling Championship which concluded this past weekend in Lethbridge. Smith was chosen to be part of the program where he got to watch Team Japan practice, along with being introduced with the team to go with a team jacket, as Smith stood with the Japan curling team during the national anthem during one of their matches. Winning tickets to the men’s championships for his family, Smith was front and centre in the player’s box to watch Japan’s match with China. “There was some butterflies when I was walking out (with the Japan team),” said Smith. Smith has been curling at the Taber Curling Club for approximately four years and has taken to the sport where he was able to watch it on one of its biggest stages at the Enmax Centre earlier this month. Japan would end up losing to Switzerland for the bronze medal, while Sweden defeated Canada in the gold-medal final. “I enjoy the game. It’s a really fun game to play. There is a lot of strategy,” said Smith who plays mostly skip as a junior curler.